I got a community comms network up. The BEARS (Bitterroot Emergency Amateur Radio Services) is a small local working group of mostly radio guys. Technologically I hang on by my fingernails in this company, but am an organizer, a real one. So I run the monthly meetings without title… this is a rather organic group. I am a good cat herder. I like driving the bus from the middle row. I have worked with the radio geeks on my white-board at meetings in order to determine best ways to provide EMCOM when the phones and Internet fail us. 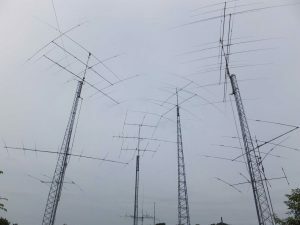 At our last two monthly BEARS meetings using HF (as opposed to UHF or VHF) blasting relatively long-wave ham radio signals straight up for the Ionosphere to reflect straight back down turned out to be the ideal short-range backup-comms plan. I spent a few days building an antenna that specialized in that mode – after many weeks of considering, planning and preparing to do this. Today I sent an e-mail reminder to all BEARS and the more social-ham-focused club (much bigger audience) that we were going to work this mode. Tonight 8 of us were on the air that way. That, folks, is a quorum. It gets better from here. With our antennas optimized for radiating straight up to the F2 layer and straight back down. NVIS is unique in the HF band in that signals land in about a 50-mile radius from the transmitting stations. While lower-angle-radiation can reach around the world, NVIS is very local. [T]he accumulation of all powers, legislative, executive, and judiciary, in the same hands, whether of one, a few, or many, and whether hereditary, self-appointed, or elective, may justly be pronounced the very definition of tyranny.